OK, for real this time! 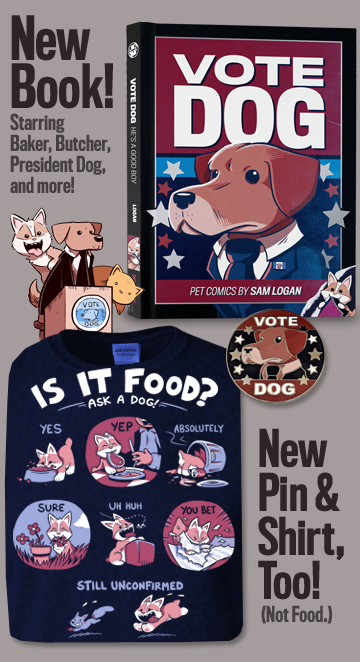 Place your order for Sam and Fuzzy swag today before Noon EST if you are using USPS Domestic First Class or USPS Global Priority and want it to arrive before Christmas. After today, pre-Christmas delivery will still be available, but only using speedier and more expensive shipping options. It's true... sometimes the characters and concepts that sneak into the comic are based on very old ideas! But don't read too much into it... even I don't plan that far ahead! Brain's design absolutely stems from that old drawing, 100%. Ever since I made it, that design has just been sitting there in the back of my brain, occasionally sneaking out in random sketches, waiting for the right opportunity to finally get used somewhere. And now it has! Man, this also makes me realize I haven't posted any new art in that gallery section since 2004. Talk about neglect! I have just one question for you, David. Who are Alphonso and his lover? 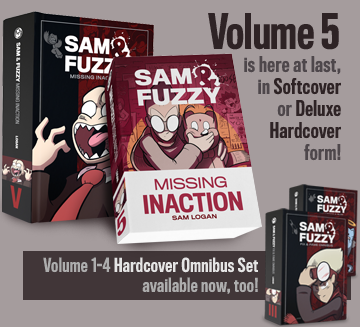 Because there are no cats in Sam and Fuzzy. I think you are the only person seeing these cat "characters". It's probably a sign you are severely disturbed. Especially if these cats start telling you to burn things. But while comics are my greatest muse, Brian is a guy who is interested in working on all kinds of different projects. So for as long as I've known him, his comic production has always been a thing of fits and spurts. 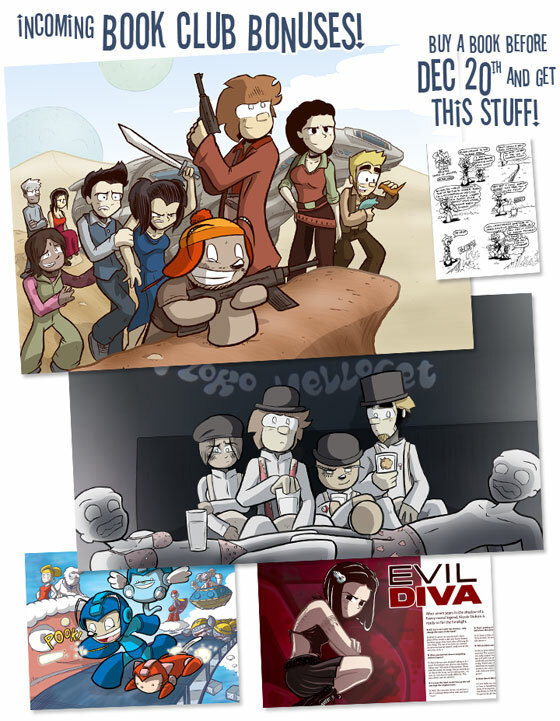 Sometimes he will do a bazillion comics at once, and other times he will go for months without drawing any at all. It is just the Brian Carroll way. Following him on twitter is probably the best way to keep appraised of his activities, comic-making or otherwise!